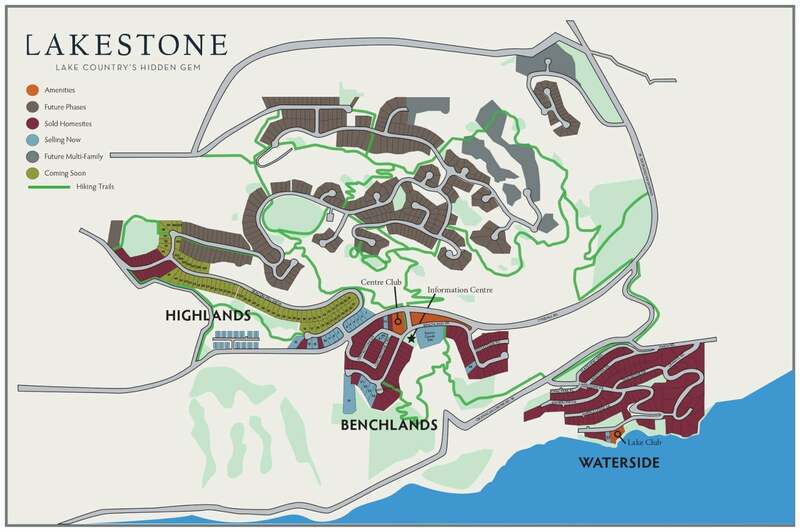 Few communities in the Okanagan can compete to the luxurious lifestyle that Lakestone provides. Combining the three neighbourhoods of Highlands, Benchlands and Waterside, Lakestone spans over 550 acres of stunning Okanagan landscape and provides exceptional amenities including the Lake Club, Centre Club and private beach. Lakestone residents can also enjoy over 25 km of trails which weave from the lake shore, through the 250+ acres of preserved natural open space to the summit of Beacon Hill, where you will find serene panoramic views of Duck, Wood, Kalamalka and Okanagan lakes. With the goal of maintaining and utilizing the natural landscape, the master planned community of Lakestone offers a wide variety of home sites ranging from amazing lakeshore homes to gorgeous hillside and lakeview estate properties. With many premium building lots still available, Lakestone also offers many chosen custom builders that can design and build your perfect dream home. Located close to Kelowna, Lake Country and the Kelowna Airport, Lakestone truly is a one of the best luxury communities in the Okanagan Valley. Book a private tour of Lakestone today and let our agents show you this incredible hidden gem. Many Okanagan Valley real estate agents choose to not publicly share their listings to competing Brokerages and agents websites. Additionally Builders within Lakestone may have homes nearing completion that could be perfect for you. Our Luxury Home Specialists have access to all listings that are currently for sale in Lakestone, and are aware of upcoming builder inventory. For a complete list of home for sale in Lakestone, or any other Okanagan community, complete this form.